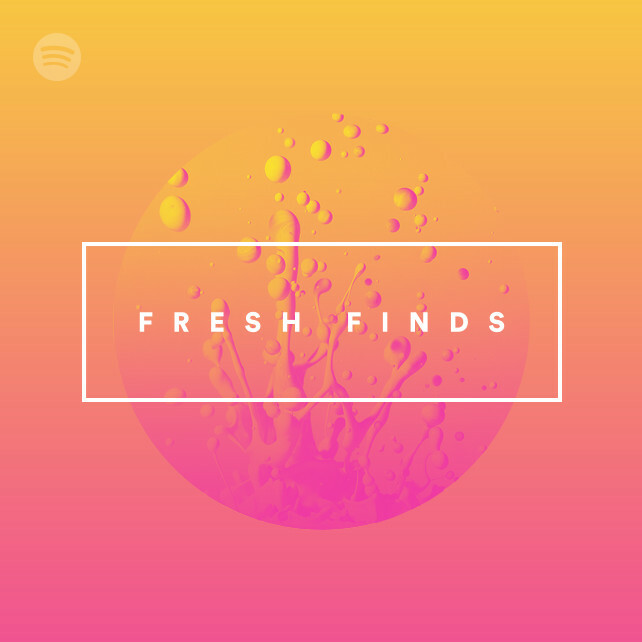 Featured Series – Spotify: Fresh Finds. As far as music discovery on Spotify goes, the holy grail for underground and/or indie musicians is Fresh Finds. Refreshed each Wednesday, this playlist series combines complex algorithms that leverage big data with loving human curation. And it’s made for a uniquely special platform which has led to: massive, rapid growth for otherwise completely unknown and obscure artists; further placements for the latter in coveted Spotify playlists; signings to major record labels; and myriad other opportunities for artists whose music has been featured. In an era of increased competition and saturation within the music industry, but also of immense opportunity, Fresh Finds is one of the great democratizers of music. No longer does an artist or band require the support of a massive team, major label, or even a manager – all it takes is one big break, one single playlist placement, and things can take off from there. Fresh Finds is Spotify’s way to help listeners discover new music and artists that they would not have heard of otherwise. Updated weekly, this playlist features artists who are truly at the beginning of their music career, are predominantly independent, and who may or may not have a manager or small label backing them. Unlike playlists such as Discover Weekly and Release Radar, Fresh Finds is not tailored to fit a user’s specific music tastes, but rather is designed to curate to a large audience – Fresh Finds’ fast-growing flagship playlist currently counts over half a million followers – music that is different from what they usually listen to, in the hopes that listeners will connect with something brand new. The point is not a personalized playlist that’s perfect every time. It’s supposed to challenge you a little bit, says Brian Whitman, founder of Echo Nest (a music data firm that Spotify acquired, and whose technology was used extensively in the creation of Fresh Finds). Spotify’s algorithms crawl the web for up and coming artists that are generating buzz on music blogs and other sites. They then identify 50,000 “music opinion leaders” – anonymous Spotify users that have been algorithmically shown to have consistently listened to artists before they got big – before analyzing these users’ playlists to pick out a few hundred brand new underground songs. Staff at Spotify arrange this music according to genre, and adjust play orders to ensure that the Fresh Finds playlists fit together and put listeners in a certain mood. Athena Koumis, Fresh Finds’ curator, listens to 1000 songs per week to create the main Fresh Finds playlist and its genre-specific subsets. (1) Increase your presence on music blogs and review sites. 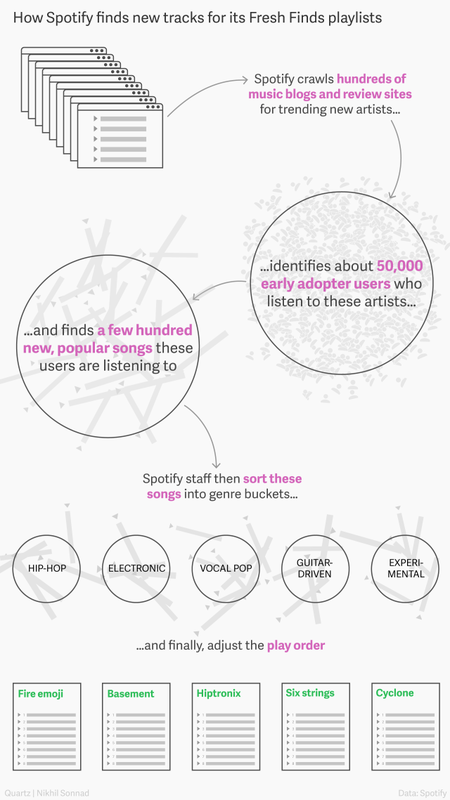 The more online buzz that you generate, the more likely it is for Spotify’s algorithms to pick up on your music. Either personally or through someone else, reach out to the editors of, and writers for, these sites. Develop a personal rapport, or cold email if you must, but always personalize your communications in discussing how you might leverage their platform to promote your music. Offer to provide exclusive or otherwise unique content in the way of a premiere, interview or otherwise. (2) Get as many people listening to your music as possible. This one may seem obvious, but the more your music is being listened to, the more people will be sharing it online through social media and blogs, and the more likely Spotify’s algorithms – especially the ones used by Fresh Finds – are likely to pick up on it. It doesn’t take thousands of plays, either. In fact, Koumis has mentioned that Fresh Finds can pick up on artists with as few as 100> monthly listeners – so a few listens go a long way. By leveraging existing social channels and redirecting listeners from SoundCloud through buy links and otherwise, you can build the initial traction needed to get picked up by these clever algorithms. Once your music is picked up by Spotify’s algorithms, it then has to catch the attention of the curator(s) in charge of the Fresh Finds playlists. The best way to do this is simply to stand out from other artists – go against the grain and make a splash! At the end of the day, good music is good music. And with Fresh Finds, Spotify is helping unknown artists making great music in ways never seen before. It’s nothing short of a musical revolution.